Surrounded by tropical forests and marine parks, Cala Luna Hotel & Villas is a peaceful setting to soothe the spirit. Bask in the exquisite blend of privacy and intimacy created by the sophisticated and peaceful environment. The utterly unique tropical hardwood architecture blends marvelously with flourishing exotic plants in a delicate harmony of elegance and nature. Cala Luna offers two-bedroom villas, each measuring approximately 1,350 square feet and comfortably accommodating four people. The hotel also has three-bedroom Master villas, providing room for up to six people. All villas are equipped with fan, a/c, direct line telephone, cable TV, stereo CD player and fully equipped bathrooms. The kitchens boast amenities such as an espresso machine and a microwave oven. In addition to the private villas, there are deluxe hotel rooms. 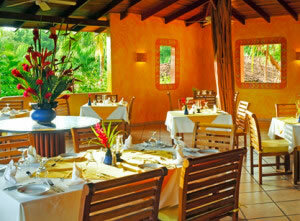 All are surrounded by luxurious vegetation of abundant silver palms, delicate hibiscus and colorful bougainvillea. All the rooms have patio terrace, a/c, fans, fully equipped bathroom with hairdryer and oversize tub, cable TV, telephone and private safe. The Cala Moresca restaurant offers fine dining throughout the day, with an international menu and a wide variety of premium wines. The Caleta sushi lounge offers a relaxed outdoor atmosphere, surrounded by the newest garden, perfect for sampling some of the sea’s freshest delights. The menu features traditional and fusion sushi dishes and appetizers. 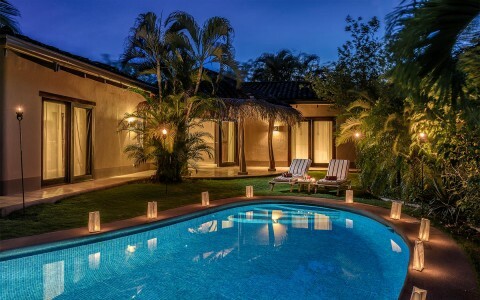 Located at the far west end of Tamarindo, Cala Luna is in the increasingly popular Guanacaste region. Featuring some of the most beautiful and unscathed areas of the country, this region is abundant with wildlife and sea life.